Lots of free parking in mall area lot. 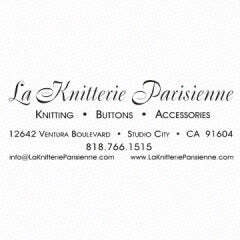 La Knitterie Parisienne inspires knitters and crocheters with its vast selection of yarns, from high-end fibers to eco-friendly yarns and everyday basics, including a large array of new and vintage buttons. Located at the heart of Studio City, the shop provides a warm and inviting atmosphere for new and seasoned knitters to gather, bond and knit. La Knitterie Parisienne specializes in creating custom designs and free personalized knitting and crochet lessons and will help clients every step of the way, from cast on to cast off. La Knitterie Parisienne features the largest collection of yarns in the San Fernando Valley, including specialty yarns such as cashmere and hand-dyed. Restaurant next store to the shop.